BUT I do have things to show you.. soon. A few months ago I saw this quilt on Aesthetic Nest and fell in love. Bonus - there was a tutorial! So of course, I had to try, it just looks so soft and cuddly! I liked it so much, I made two! Keep in mind, all that cutting, I definitely wore out my scissors! Ah! I'm in love. That is amazing. Will have to try to find the tutorial. Thanks for sharing. Catching up on my bloggers and bear with me...YAY to Maui! Cute bee, if only I had time! And these are too cute! I love the "chenille" blankets!! 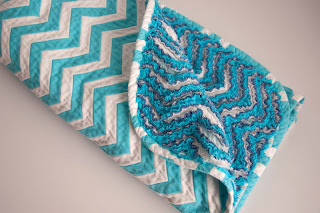 I have seen a few tutorials, but the chevron pattern is really special!!! I love these! I saw it a while back too and wanted to make one but never did. They have chenille cutters that make the cutting a lot easier. These are lovely tho-I love the colors! Very cool! They would be perfect for winter! What a great idea. It's always fun to try something new! What do you mean I'm moving? ?